No delivery in the USA The FEYAN is a high-end binding for experienced splitboard riders wishing to conjugate reactivity, performance and lightness. Perfect for racking up vertical, the FEYAN is with you for conquering summits on a splitboard. Thanks to the numerous adjustments in the WoR (Walk or RIde), you can totally personalize your binding depending on your ride. The base of the FEYAN binding keeps the essentials without neglecting solidity. The carbon spoiler gives an ideal hold without superfluous compression, better torsion resistance, and increased riding precision of the board. Thanks to the WoR (forward lean) the adjustment of the climbing mode (negative angle of -5°)to the downhill mode (positive angle of 0°to 20°) can be executed very quickly. Available in S, M and L, an easy and wide adjustment on the heel-cup ensures perfect adjustment for your boots. Binding guaranteed 3 years. 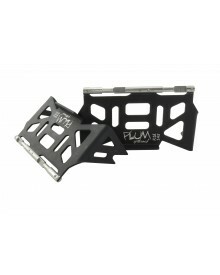 Sold with a 2-part interface, bindings compatible with all PLUMsplitboard interfaces.